Some are calling it the golden age of television. In the last decade or so we are seeing an incredible wave of episodic television productions of the highest quality, bringing to life a variety of stories and storytelling talent that explore wider story arcs enabled by the longer format. 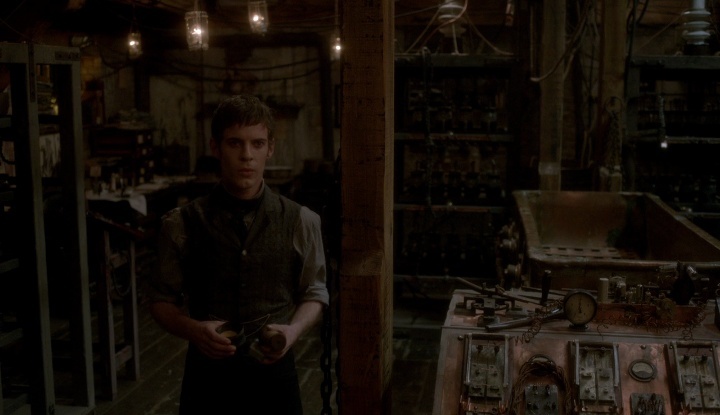 Showtime’s “Penny Dreadful” is undoubtedly one of these shows, with two amazing seasons under its belt and third season returning to our screens on May 1 this year. In late 2014 I’ve had the privilege to interview one of show’s cinematographers, Owen McPolin. It gives me great pleasure to welcome Jonathan McKinstry who is responsible for the production design of all three seasons of “Penny Dreadful”. In this interview he talks about his transition to the world of episodic television after having worked on multiple large screen movies, the differences in running an art department between feature and episodic productions, and a deep dive into bringing the wonderfully dark worlds of the Victorian era into our lives. Jonathan: I’m Jonathan McKinstry, production designer of Penny Dreadful at the moment, just finished working on season 3. I started around 1982-83 after having done a degree in interior design. I knocked on lots of doors and did a couple of summer jobs working for Granada Television in Manchester, and then knocked on lots of doors with my portfolio in London, managing to get my first job on a film which was “Return to Oz”. Since then I gradually worked my way through the art department as junior draughtsman, draughtsman, assistant art director, art director, supervising art director to, presently, production designer. Kirill: Those were the days where you didn’t have a lot of digital tools at your disposal, so you’d either build the sets physically or do miniature sets to emulate larger-scale vistas. Jonathan: Certainly CGI [computer generated imagery] didn’t exist when I started, and it was all foreground miniatures, false perspectives, matte paintings – the technology that the first Star Wars had, really. Kirill: And that worked pretty well in the world that didn’t have high-resolution digital cameras, in the television world as well as in feature film. Jonathan: Obviously making dragons fly was much more complicated, so that would become stop motion or some kind of animation or claymation that they used on my first film “Return to Oz”. But now with computers there are so many things that can be done in post-production, and sometimes it’s the easy option for the director or the producers that they don’t have to make a decision upfront and want to fix it later. It’s not always a cheaper option, it depends on how it’s used and when it’s used. Kirill: As a production designer you don’t usually get to stay into the post-production phase. Does it worry you that you don’t have as much control or influence over the production design side of the final product? Jonathan: A little bit. People at Showtime have been very good with me and usually involve me via email even if I’m not working on a project. I’ve had a degree of say over what things should look like, and where possible I’ve tried to give input of what things should look like during the shooting process. Obviously there are quite a few months of post-production when I’m not around. I think that as long as people set off on the right direction, they’re very skilled at what they do. It’s when they are not set on the right direction, when there’s a mismatch between somebody sitting down at a computer on the other side of the world and thinking about what is being physically created. 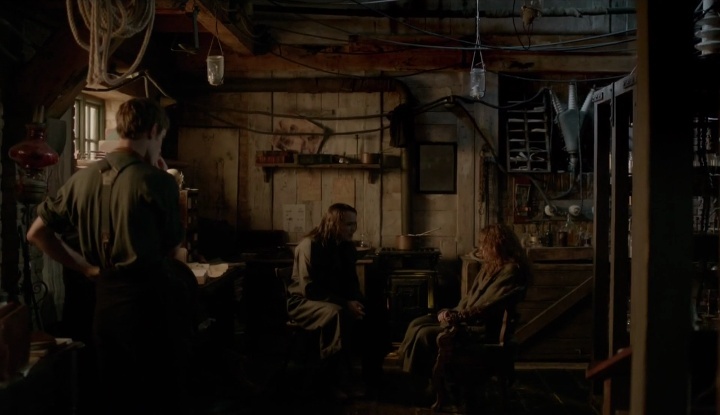 Kirill: Especially, if I may jump a bit forward, if you’re talking about a world of Penny Dreadful that is rooted in a very physical world of the Victorian era. Jonathan: There are still quite a lot of visual effects, a lot of cleanups and animated inserts. But in terms of the 3D world beyond the physical set we’ve built a backlot set and anything above 22 feet is digital extensions. I’ve had as much input as I can to try and guide them as to what I thought that should all look like. They’ve sent me reference images of what they were working on for me to approve. Even if we are a relatively modest TV series with a relatively modest budget, certainly not an HBO budget, we still are trying to manage and achieve some pretty big looks, as big as we can. Kirill: Especially when giant high-definition TV sets are quite affordable, and you can pause, rewind and rewind again to take a look at a particularly interesting scene. Jonathan: The days of “made for television” are long gone now. With 65-inch LED high-definition 4K sitting two or three meters away on a sofa they are probably seeing more details than they would on a big screen in Leicester Square. You literally have to treat it as a movie or even better, certainly for the finishes and details of things. Kirill: How was the transition from feature film to the world of episodic television? Is it more interesting that you have that much more time and space to develop and build out the world for the story? Jonathan: On a movie you have more money to spend per minute, but what’s great about TV is that you have a bigger and longer story to tell, and actually more sets. That becomes a bit of a logistical nightmare because the scheduling is pretty packed and quite often we have overlapping units for blocks of episodes in an attempt to economize. Quite often the end of a block of shooting that one director might be doing may have a five or six day crossover period that the next director is shooting his episodes. Some of those days can be frantic with maybe six or seven sets suddenly coming together at the same time. Kirill: You stay on for the entire season, and you have the show creator and producers, and then you have different teams of directors and cinematographers coming to shoot separate two-episode blocks. They can have their own take on the sets, on how to tell their part of the story from the cinematic point of view. Jonathan: Absolutely, and quite often we have reconfigurations of lighting for the cinematographer. Obviously each director has their own way of dealing with things. If there are some things that were established previously, then the director more or less has to accept those in terms of the set. Sometimes you modify the lighting, and sometimes you also have new sets that have never been seen before and you try to give the director that works on those sets as much input as possible. But quite often because they only have four to five weeks of prep for their particular block, there are set and location commitments that I have to have already made. I try and give them as much flexibility within that as possible. Location commitments involve closing roads and other things, and it takes several weeks of advanced planning. So when they come in, and I’m not saying it’s a fait accompli, but they more or less have to ride with how we’re dealing with things. We can just have a small frame of modifications for them within that. 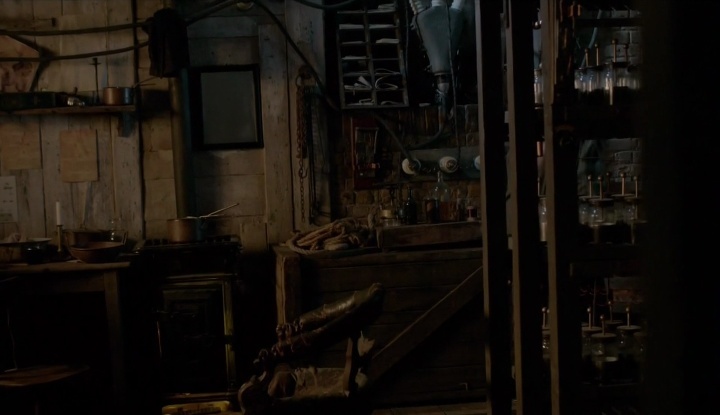 Kirill: If you’re talking about major sets, like the theater in the first season, Dr Frankenstein’s lab in both seasons or the witch mansion in the second one, those are not defined by a particular director. Is that between you, the show creator and the producers? Jonathan: Mainly yes. John Logan is the showrunner and creator, and he is very hands on, and even more so in the first season. He’s starting to trust me a little bit more now [laughs]. He has the first pass of everything, and then every director comes along and says “wouldn’t it be nice if …”, and certain things get modified if they are achievable within the time and the budget. That’s all great. I’m happy to take it all because everybody wants to feel a part of the creative ensemble. Kirill: But then you don’t want to create too much difference because I as a viewer see the full season story and not individual episodes. Jonathan: It’s the general overview that comes in terms of design from myself and collaboration with John Logan the creator. Kirill: How many months in a year does a season of Penny Dreadful take for you? Jonathan: The production side of season two ended in March, and the episodes aired from May till July. I’ve had about three months off in between, and started season 3 in June. Initially I’ve worked on some concept ideas from home for a couple of weeks, and then came over to Dublin around July. And then we’ve started to film at the end of August, and it went through early spring. Kirill: So it would be unrealistic for me as a viewer to ask for more episodes in a season and for you to maintain the same level of production quality. Jonathan: I don’t think it would be physically possible [laughs]. Or they would need two production designers working in parallel because I don’t think that I could be in quite so many places at once. Kirill: It seems that the new wave of high-quality episodic television has settled on 8 to 12 episodes per season, which calls for much tighter scripting as well. There’s a story that you tell and no need to add fluff to just pad the episodes. Jonathan: I think there are productions that are certainly less intensive in terms of preparation. It’s easier to have quite a lot of episodes of a contemporary cop show than on a period drama where everything has to be created. You can’t just go on a street as it is now. You have to prepare it. Any period drama has that much more preparation time and set building. And the horror genre has another aspect that adds another level of creativity to how things look. Kirill: How much different was it for you to prepare for the first season where everything was new, compared with the second season that has evolved within the existing world? Jonathan: The second season, funnily enough, wasn’t any easier. The first one was hard because we’d started off in London, and it was all meant to be made in London, but there was no studio space available. It was rapidly becoming obvious that it wasn’t possible, so Karen Richards the line producer suggested Dublin. 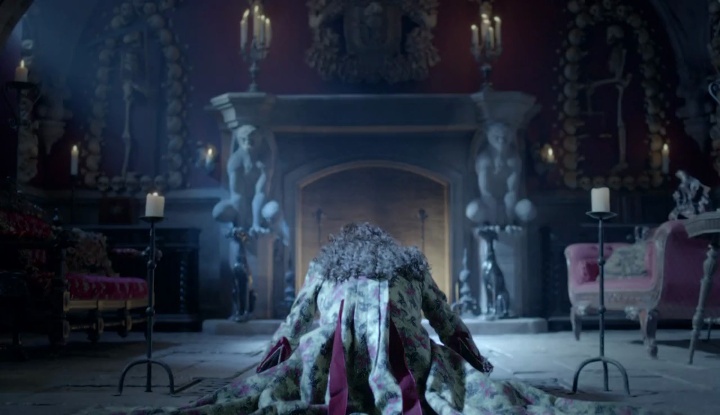 She’s from here and she’s worked on “The Tudors”. She asked my for my thoughts and I said yes. There’s a lot of English architecture here that could definitely work. And so without radically changing the shooting schedule, perhaps pushing it back by one or two weeks, we suddenly found ourselves eight to nine weeks down the line and starting all over again. It was a really massive logistic problem of redesigning sets, getting them to fit the stages that were here, some sets that had to be completely redesigned because they had to be based around completely differently-looking locations. So that was season one that was full of energy, full of fear. We didn’t know John Logan, he didn’t know us, and we tried to get it off the ground. And then season 2 required us to get a big backlot set ready because they didn’t want to shoot so many locations. They wanted it to be more controlled, so we built a backlot set for Soho that also had to serve as a few other places. We’ve had the witches’ mansion for Evelyn Poole and lots of other locations and bits around the studio. It just felt like another challenging season, really, even though it was doing the same things and we’ve had stock sets on some of the other stages. There are enough challenges to make it feel not that dissimilar to season 1 in a way. Kirill: And that is also coming from the show creator that doesn’t necessarily want to rehash the same locations for the new story arc in a new season. 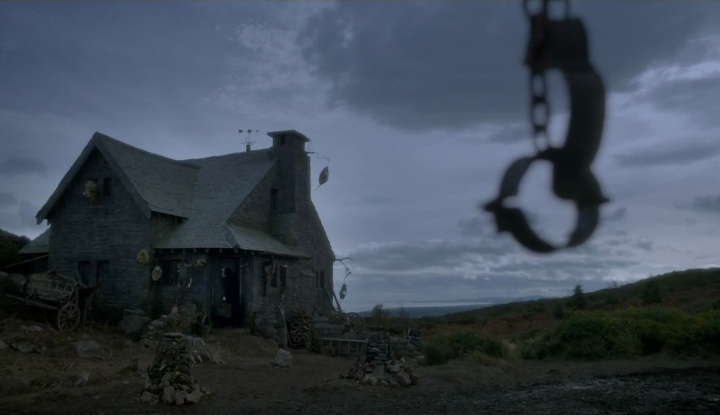 I noticed that it spends less time in Sir Malcolm’s house if you just compare it to season 1. You’ve added the fantastic witches’ mansion and the rustic village house for the old lady; what is the story behind making that house? Jonathan: We’ve built the interior on stage, and then we’ve built the exterior on location which was only 10 minutes from the studio. It was just about far enough into the hillside near the coast that it was almost a 360 degree around it, but practical from the point of view of filming and taking equipment to it. Kirill: What happened to that house? Did you tear it down? Jonathan: That was gone as soon as we’ve finished. Kirill: Is it sad for you to see something like that just gone? Jonathan: Not really. The saddest set to pull down for John Logan was the theater. He loved the theater because he has theater origins. The set was almost a working theater. We built the auditorium and the stage, the gantry levels up above the stage with backdrops that could be flown in and out. You could literally walk all the way through the theater in one go without having to cut. It was based on Wilton’s Theater in London. I had taken John there when we were based in London, and he fell in love with the look of it. But that theater has a really small stage and almost no backstage space, and so when we decided to build it here, we could incorporate all of the extra things that Wilton’s couldn’t have given us. We’ve also built the understage space in a separate area for The Creature to operate all the trapdoor machinery. Kirill: When you build the sets, do you try to create a complete 360-degree environment for the actors and the crew, even though some of that is not going to be captured on camera? Jonathan: In most cases yes. In some cases, for budget reasons or if the scene is not big enough to demand it, it may be a three-sided set, but mostly it’s four-sided sets. I try and create something that is appropriate for the character and that also tried to bring the atmosphere of what the story is trying to tell at that point. Kirill: With digital cameras the cinematographer can shoot for a longer period of time, capturing more of the sets than they’ve used to. Jonathan: Absolutely. They don’t keep changing the film reel. And the technology is so much more sensitive to contrast and to low lighting levels. Places that would’ve been impossible to film in twenty years ago are good now. Kirill: And the cameras themselves are smaller so that you don’t need to build artificially larger spaces. Jonathan: We still build sets with floating walls for practicality so that they can be slightly bigger. But they can operate on locations in tiny spaces and you can still manage to achieve great-looking things. Kirill: How much different is a set that you’ve built from what we see on the screen after all the editing in post-production? Are you sometimes surprised to see what they did to your work? Jonathan: Sometimes [laughs]. Sometimes we see less of it than I was hoping. They shoot a lot of stuff and some of it gets edited out. Sometimes they don’t shoot half a set anyway because of a tight schedule where they’re racing through a day. Between building a 360-degree set and maybe them racing through the day to get the scenes that they need to get, maybe they get 80% of the set. By the time it’s gone through editing we get something like 60% of it on screen. Kirill: It’s a horror show and there are some pretty macabre visuals in the final version. Is it as realistic on set as it is on the screen? Jonathan: It can be pretty gruesome in some instances, and pretty creepy. Especially when you walk on a set that is on a stage and maybe there are only a few work lights on at the time, and there are all those dolls peering down on you, and the cave is creepy. Definitely people have felt twitchy sometimes. 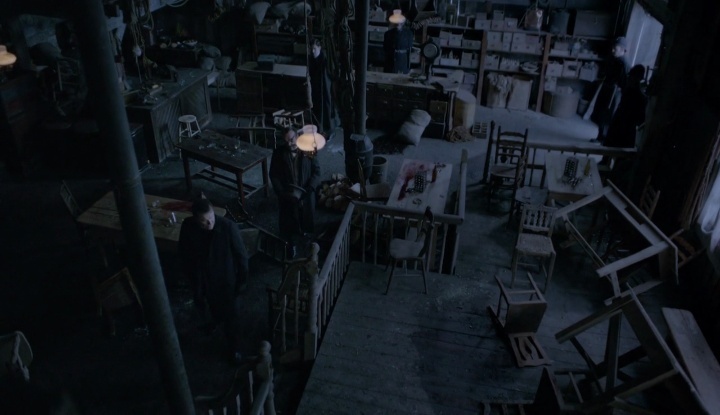 And then we had a location on season 1 where they’re looking for Sir Malcolm’s daughter behind an old warehouse of an opium den, and there are all the dead bodies where they first encounter the vampire. That felt like a slaughterhouse in there. We had piles and piles of bodies and blood everywhere, and even a prosthetic baby on the floor, but all the crew felt sorry for a dead dog [laughs]. 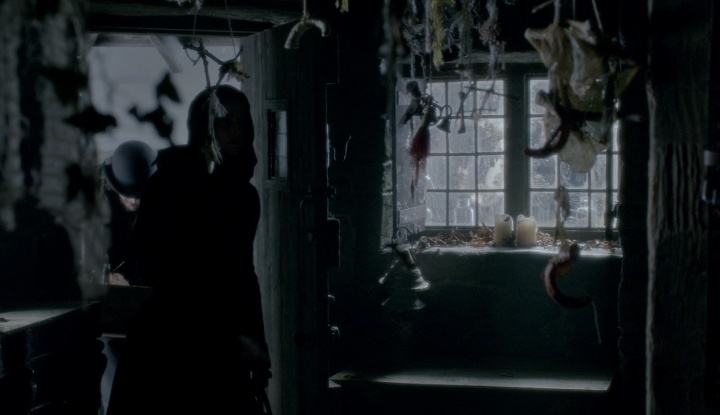 Kirill: How much time did it take you to build the interiors for the witches’ mansion and the wax dungeons where The Creature was employed in season 2? Are we talking about weeks or months of work? Jonathan: Both, depending on which you’re talking about. Evelyn Poole’s mansion was a complex set that was sculpted, and it was probably around four months to build. It was built on two levels. The opening scene had her lying in a bath of blood humming a tune, and I wanted the camera to wander through the house and then find her upstairs. I thought we needed that image to try and get that first moment of establishing her and her house, so we built the upper floor above the main floor of the set. The basement of the waxworks where The Creature was working was actually a revamp of the understage of the theater set. It was half there, reconfigured, repainted, waxed up and redressed. Kirill: Did you make any changes to Dr Frankenstein’s lab between the seasons? Jonathan: Slightly. We’ve had the birth of Lily who was Brona, and we had to adapt the system, to make it seem like he (Frankenstein) had learned a few things and became slightly more sophisticated about the method of bringing somebody to life. We changed the chair that the first creature was born in into a bathtub, and she was surrounded by amniotic fluids, and the cables went into the sides of the bathtub as opposed to through his head, to sort of spread the shock out. It was as though his learning of how to bring people to life was becoming more sophisticated. Kirill: Does a set such as this that is featured in multiple season just sits there somewhere on a studio lot, covered with plastic sheets, waiting for you to come back to it the next year? 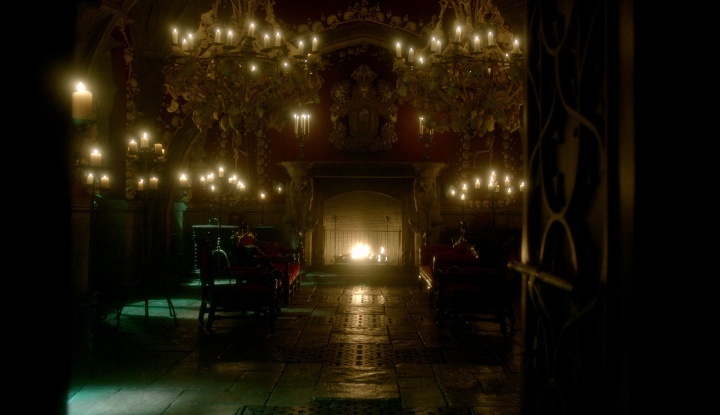 Jonathan: There is a backlot set, and we have filled all of the stages at the studio apart from the one stage that was the theater in season 1 and Evelyn Poole’s mansion in season 2. Each season’s sets were struck out, and that stage was the only empty stage left at the studio so that it could rent out in between to somebody else. And the rest of the time the company is paying a rental fee to keep the sets on the stages. Kirill: And if we’re talking about a more administrative level, when do you know that the show has been renewed to another season? Is it in the middle of shooting the current one? Jonathan: No [laughs]. We’re told to preserve everything, or as much as possible. There was talk of maybe a season 3, and certain level of preparation was being put in place, but there was no official green light until June, I think. The studio sees the ratings when the show is airing, sees if they want to risk another load of money on another season. All those decisions are made back in LA, and when they decide, we get told to go full steam ahead again. Kirill: As you were going into your third season, and you’ve mentioned that you’re there for nine months out of twelve, does it feel like more or less a permanent job? Jonathan: It is and it is hard to see my family because I live in Spain. For nine months out of a year I’m a bachelor living for work basically and to pay the bills [laughs]. In a way that’s why I’ve chosen this job. I did three seasons on “The Borgias”, and as my daughters were growing up, it gave me a certain amount of stability to know that I can pay the bills, and some stability with the time off that I felt was worth to come back to afterwards, to enjoy it instead of thinking when is the next job going to come. Kirill: It feels like the world of feature film is nowadays divided between gigantic tentpole productions and small indie films, and the middle that has been hollowed out with creative people (both crew and cast) moving to the world of episodic television – to established networks and new players such as Netflix. What are your thoughts on this? Jonathan: I think it’s probably the future. I worked on many big movies but they can sometimes get out of control. You could probably make a series like “Penny Dreadful” out of the waste of one of those big movies. I don’t know that big movies have a long-term future, and they all seem to be going the same way. They’re all rapidly becoming Marvel comic video games as opposed to storytelling. I’m not sure that I like the way they’re going. I think that television series with the potential of long-term building of characters and storytelling has got good quality to it and something more interesting to say. Potentially, of course, because there’s a lot of not-so-great stuff out there as well. Kirill: That also taps into the business side of things where the studio executives are following the money and the audiences’ attention and where people are spending their evenings. People might not be going to the movie theaters as much, preferring to binge watch high-quality season installments instead. Jonathan: And also buying a box set and adding that to a collection, watching them afterwards as opposed to just two hour long movie. And with HD television you’re really watching good quality stuff. Kirill: Does it feel sometimes that you’re wearing two hats, one of the creative artist building the worlds and the other of an accountant that is balancing the budget? Would you want to have all the money in the world? Jonathan: Yes but then no. It’s more creative to be constrained in a way. It’s easy to spend money. But it’s spending it wisely and trying to create something that feels good for the budget that you have. I know just from having built my own house in Spain over the last few years – when you have a budget, you have a budget. What’s the point of an architect coming up with some fantastic thing that you cannot afford? At the end of the day it has to be appropriate to whatever money you have available. 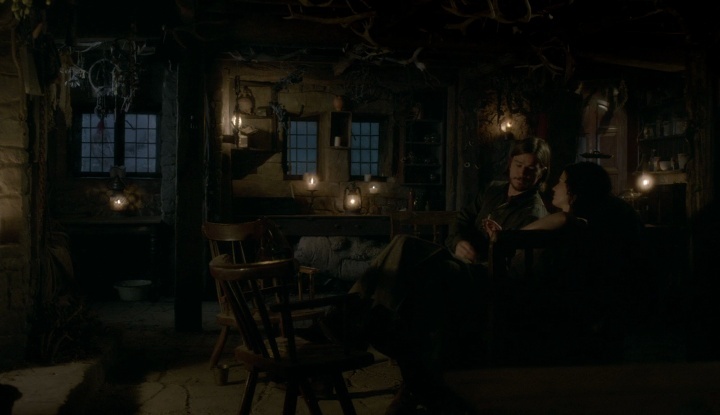 Kirill: Do you get to enjoy watching “Penny Dreadful” when you were there on each set and saw the shooting and you know what’s happening? Jonathan: Not in the same way. Horror relies on surprise and tension, and when you know what’s coming, it’s not the same. And obviously I watch and analyze and criticize my own work. I’m not quite as subjective, I’m a lot more objective about it. Kirill: But then you still get to see the final edited version with all camera switches and music and sound effects. Jonathan: It’s absolutely great to see it for the first time. The music now is established, and there are different soundtracks for the different parts of an episode. I think music is incredibly important for any project, and there are sometimes films that fail because of poor music that is not appropriate. Music is more important than people think. Kirill: One of my favorite parts about the show is how it creates the tension not by zooming in on a gory part or loud sound effects, but rather moving the camera away from the action and leaving me as the viewer guessing at what is happening beyond the edge of the frame. Jonathan: It’s like reading a book or watching “Jaws”. When you don’t see something, your imagination imagines it far worse. Playing with people’s imagination is part of the trick of scaring them, because the moment you see something, it scares some people but it doesn’t scare some others. You never satisfy everybody. But if you don’t show something, everybody can imagine what it is. I would personally, for example, prefer to have never seen Dorian’s portrait. Had nobody ever seen it, they would’ve always imagined it the worst way they could’ve imagined it, whereas now it may have made some people feel good about it, and may have made other people not so good. Kirill: As you go into a movie theater or watch something at home on your TV, do you get to enjoy other people’s work? Do you find yourself analyzing the more technical aspects of productions that you haven’t been involved with? Jonathan: Yes, if the story line is weak and it’s not a particularly great movie, I find myself analyzing and criticizing and not really watching it for the storytelling. If it’s a great story, then like anyone else I get completely lost and then I need to watch it again to analyze it. I love getting completely wrapped up in a great piece of storytelling, and just like anyone else I wouldn’t know what was a set and what was a location, what was real and what wasn’t. Kirill: I find myself recently migrating away from going to 3D “versions” during the theatrical run. If the story is good and the world is compelling, you’re there. It doesn’t matter that it’s projected on a flat rectangular screen, and I can’t remember liking a movie because it had that forced extra dimension to it. There were a few technical attempts to bring the 3D technology to television sets, but it doesn’t feel that we actually need that to enhance the storytelling. Jonathan: “Avatar”, for example, which was the first movie to bring 3D back again, was a very beautiful looking movie. 3D did enhance that world, I think. But for something like “Penny Dreadful” which is horror I don’t think it would help the storytelling in any way at all. It’s only appropriate for certain kinds of movies. In a way, it puts a barrier between you and the screen. It doesn’t actually make the screen come at you which is what it’s meant to do. It puts an additional layer of separation between you and what’s happening. 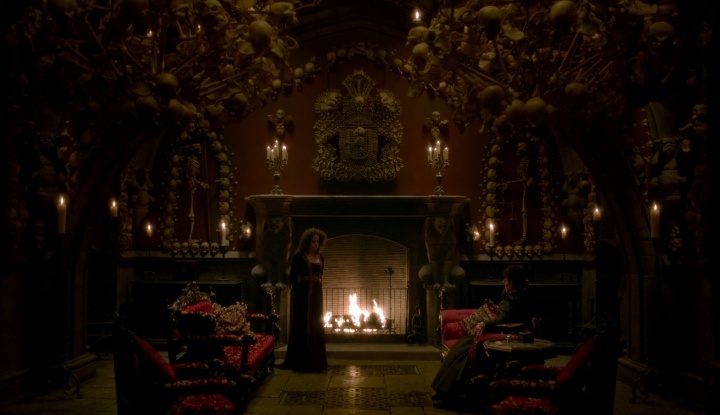 And here I’d like to thank Jonathan McKinstry for this wonderful opportunity to learn about the production design of “Penny Dreadful”. Season 3 of the show starts on Showtime on Sunday, May 1st.